Cold was there to greet you when you got out of bed in the morning, and keep you company when you climbed back in at night. It sought out your weaknesses like a patient enemy and whispered to your bones of death. It wore you down, physically and mentally, and long bouts of it could break you. I've noted before how horror works terrifically when set in a cold environment, and Winter Wolves (Bantam Books, March 1989, cover art by the great Tom Hallman) by its title alone fits the bill. 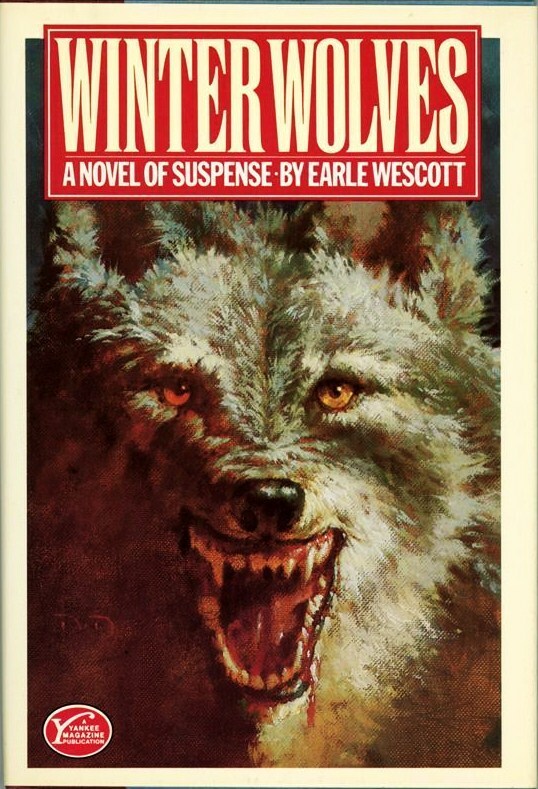 And with this vividly written, powerfully-told tale, creative writing professor and one-time novelist Earle Wescott (b. 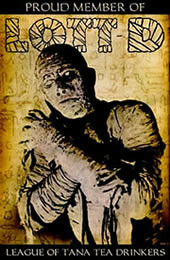 1946) has fashioned a frigid adventure yarn crammed with convincing details of horror, madness, and death. 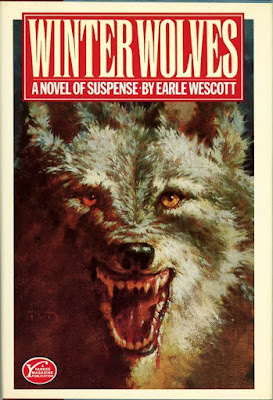 It is a shame Westcott published no other novels, for here all the moving parts work just right: setting, character, dialogue, relationships, motivation. His scenarios, whether in a newspaper office, a homey restaurant, a hermit's shack, or the wintered forest itself, are all presented with utmost realism, with the palpable sense of real life as lived, all put down honestly by a person who understands and respects the craft of the written word. 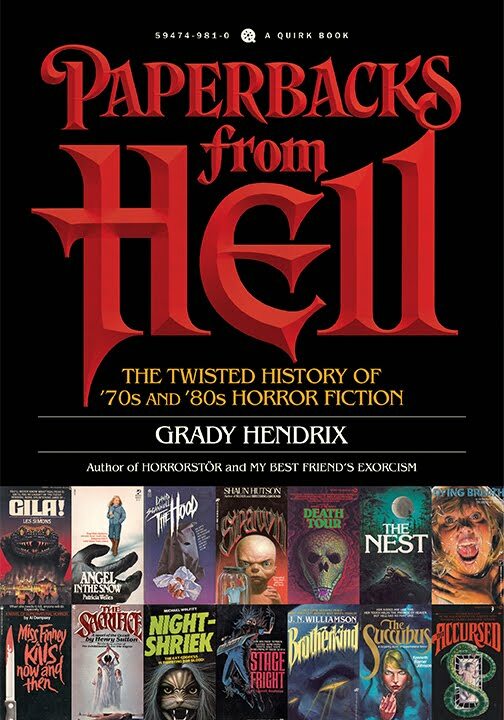 You know, a real book written by a real writer: something all too rare in the world of paperback horror fiction. 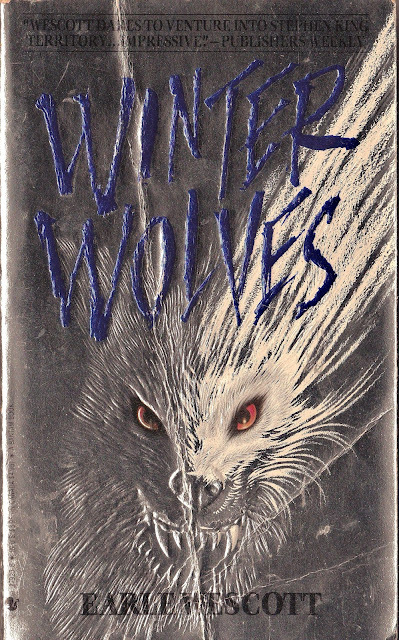 Winter Wolves begins as all creature-horror tales must: thrilling the reader with the hapless fate of one who encounters the beast(s). An elderly drunk stumbling across frozen flats notices two shapes blacker than night coming closer, and then a third blocking his way to any safety, and it smiled at him with a mouthful of star-bright teeth. Man that's a tough break, going out like that, drunk but scared sober. Chapter Two begins with another familiar confrontation: the offices of a small Maine newspaper, where editor Ray Neville wants journalist Fran Thomas to go to Thomas's hometown of Steel Harbor to report on the story behind the dead drunk found with his body mutilated. Was the drunk, name of Sam Comstock, dead of natural causes catching up with him and then mauled post mortem? Was it a pack of dogs? Was it wolves? In Maine? 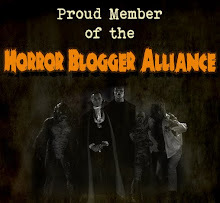 When his editor said the word wolves, Fran thought of an assembly line. He thought of the exhibit of prehistoric dire wolf skulls at the Page Museum in LA, dozens of them with only minor variation in size... how brutally mechanistic nature really was, stamping out skullcaps like brass shell casings in a wartime munitions plant. Fran speaks with Police Chief Boulting, who wants Fran to "educate the public" about the dangers of letting domestic animals run wild; no one thinks wolves are responsible, save Woody Parker, who discovered Comstock's corpse. Knowing he must speak to the reclusive, queer old man, Fran enlists the help of Caroline Parker (Westcott describes her as homely in the beautiful way redheads sometimes are), Woody's niece. From there they head out to his lonely fortified enclave where Woody sticks to his wolf story: "Nobody catches these wolves... They do the catching." 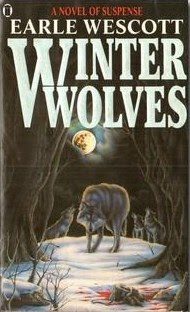 After another mutilation death, Woody is arrested, “the worst thing that could happen to a hermit, his worst nightmare, surely as harrowing as the torment of wolves real or imagined… he had become a public figure.” Before he’s taken away he says to Fran, “Think you know something, do you? Study the winter of ’24 in your newspaper and you’ll know something for sure.” And from there Fran learns of eerily similar deaths, and that old Dr. Tagen who was young then had been the medical examiner. Fran asks Tagen about it, who crotchedly reminds Fran that he is a Thomas, of the local Thomases, and implies Fran knows more about this creature case than he thinks he does…. 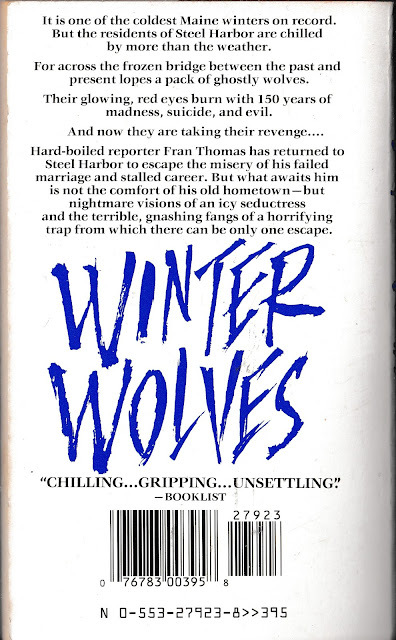 More research follows, again as it always must, and Fran reads in an 1820 newspaper about “the extermination of a verminous infestation of Wolves.” He learns that, and a little more, a fact that binds him tighter to this mystery than he had foreseen. Fran and Caroline dance around their attraction to one another, and the consummation is detailed with an experienced eye: She whispered the most marvelous things to him, sweet and obscene, in a voice that was not entirely her own. As if she were possessed, bewitched, and her words an incantation. Westcott adds workplace drama too: Angela DeGregorio, 20-something copy assistant with some exotic kind of bone cancer that has crippled one leg and chemotherapy has turned her raven hair silver; and Tommy Blackburn, an ambitious colleague who resents Fran for what he sees as the editor's favoritism. Sexual tension between Fran and Angela is uncomfortable yet all too sad and real; violent tension between Fran and Tom also so. The gripping climax of adventure and violence does not disappoint: Winter Wolves becomes both an ecological and personal nightmare. Westcott's prose achieves a natural poetry, a silvery sheen of terrible beauty as Fran confronts the phantoms of his life and dreams. A work of adult themes and situations, Westcott has produced an accomplished '80s horror novel, filled with fine writing, deft characterization, and satisfying scenes of bloodshed and eerie visions. When I began reading I expected nothing, and at first the pace seemed leisurely, leaving me somewhat cold (no pun intended); but by the end, as pieces fell into place and Westcott's abilities truly emerged, I was engaged, stimulated, chilled to the final lines. Make no mistake: track down these Winter Wolves and marvel at their icy, merciless power. Excellent review, Will. We usually have pretty similar tastes in horror fiction, but I gave up on this one with less than 40 pages to go a few months back. Just couldn't get into it. You know how it goes, though: sometimes timing (and one's mood) is everything when it comes to reading. Cheers, and I'm digging the fact that you're still posting on this blog after all these years, even if a little less frequently.